To celebrate Lia’s birthday, we are posting her ‘rich’ but tasty lasagna recipe as it is her favorite birthday meal! Keep in mind that this recipe is somewhat rich and heavier in calories than our typical recipes so indulge in small pieces. Eliminate the meat and add more veggies like zucchini, squash and carrots in the sauce. Use egg whites rather than whole eggs or use 1 whole egg and 2 egg whites. Use half the cheese in the recipe or use lactose-free cheese for lactose intolerance. If you’re feeling ambitious, make a cashew based ‘cheese’ to use instead of regular cheese. Use rice or gluten-free noodles for gluten allergies. Saute onions and peppers in grapeseed oil until soft. Add basil and chopped mushrooms and cook for another 4 minutes. Add ground meat (beef, turkey or chicken) and brown until no pink remains. Stir meat to break down into very small pieces. Add Italian seasoning, salt and pepper and stir. Add tomato paste and stir until blended in with meat. Add tomato puree and water and mix thoroughly to combine. Simmer sauce while preparing other ingredients for the lasagna. In a small bowl, whisk together the eggs and set aside. 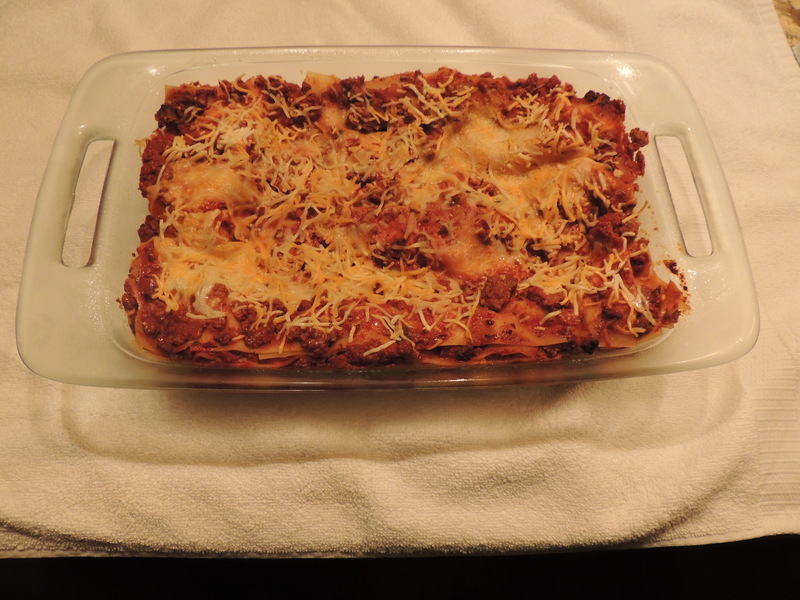 Lay out the cheeses and lasagna noodles for easy assembly. Grease 9 x 13 baking pan with grapeseed oil and set aside. Sprinkle cheeses on top of egg mixture layer. Repeat by adding another layer of noodles, sauce, egg, cheeses, etc. Finish off top with cheeses. Bake at 370 degree F oven for about 35 minutes. Let rest for 10 minutes and then serve.